The Swift Trawler 47 is a collaboration between Beneteau and Andreani Design. 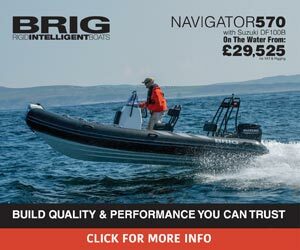 The latest in a range that has been hugely successful over a 15-year time span, this boat is likely to be as popular in UK waters as it is in hotter climates. Built with three cabins and a saloon sofa bed, the ST 47 can potentially accommodate eight when required. With an en suite shower and an independent heads compartment, the large owner cabin has the makings of a sizeable private suite. To port, the guest cabin has twin berths that can be cleverly combined into one, as well as a shower room for guests. A third modular cabin sits to starboard, and is perfect for children or can be used as a large storage room. The spacious high-quality interior can be chosen in either teak or matt oak, giving it a very contemporary feel. For extra guests, the saloon can be turned into an extra cabin by opening out a large and cleverly built-in sofa bed. With an L-shaped layout and a very large worktop, the galley is part of life aboard rather than being tucked away below, and all the more enjoyable thanks to the abundance of window space. The modular concept of the boat extends into the cockpit. Here you can fit a table together with a large bench seat, seamlessly continuing the indoor living space outside. The transom opens onto a large swim platform that can be equipped with a hydraulic lifting system, making it ideal for the bigger tender, or a water-level bathing platform. Up on the flybridge, up to three people can sit with the driver, while the remainder of the crew enjoy the fridge-equipped wet bar, or lounge on the aft-facing sunbeds. In keeping with the reputation of this range, the Swift Trawler 47’s robust appearance is matched by its practicality and safety. Large walkways, high bulwarks and numerous handrails make access and deck movement safe and easy. The ST 47 has exceptional visibility from the central driver’s seat in the wheelhouse, which seats two comfortably. The console is designed for two navigation displays together with an aft camera – essential for a large boat with a long bathing platform. Easy craft control is provided by Bluetooth connectivity to your tablet, providing simple centralised access to many of the boat’s operations. This boat can also be equipped with a joystick, either in the wheelhouse, the flybridge or the cockpit. The Swift Trawler has inspired many long-distance cruisers since it was launched in 2004, due to the seagoing credentials of the range. Performance and price have also played a big part in selling this modern-looking trawler yacht, as in real terms these boats are fast, efficient and good value for money. This new addition to the family is not only ingenious and elegant, but provides the perfect step up for anyone wanting to stretch their cruising legs at a relatively affordable price.